"Dina was excellent! Very responsive and added her own personal style to the design! Great Job!" "Nailed the personality of the business with her design. Quick with revisions and was great to work with. " "Pigi is the type of person who does an over the top job on her project. She is very good at copying exactly what needs to be done. Not only that, she is very creative and did an excellent job creating our website. I definitely recommend you at least inv..."
"A) Great designer and B) a pleasure to work with as well. Went above and beyond to make sure we got exactly what we were looking for. Responded perfectly to direction and was very good at coming up with creative solutions to various issues. And the desi..."
"The job was a landing page for a behavioural specialist and the client has a quirky nature. 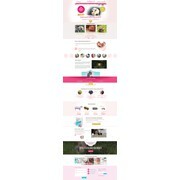 This is difficult to translate into a web design, however Pigi did exactly that. She also made any amendments quickly and communication was very strong and clear. " "Very good design work. Took notes very well. Very pleased with the final product." "Pigi was wonderful to work with and was very prompt with changes. She easily understood revision requests and design ideas. Thank you, Pigi." "Pigi went the extra mile working with me collaboratively and closely. She has design talent and good customer service. Can't beat that. " "Great working with Dina, she was happy to make changes to the files I needed and a lovely happy natured person. Would love to work with her again in the future :)"
"This was such a great experience. I was very impressed with the quality of the designs, the speed at which updates were made and comments addressed. I highly recommend this designer!" "It was an absolute pleasure to work with Dina. She was very responsive, had beautiful designs, and took feedback and direction very well. I would gladly work with her again." "Wow! From beginning to end she was creative, professional, friendly, and accommodating. I could not have asked for a better web design experience. I will be hiring her for the rest of the website, and can't wait to work with her again."